You haven't heard from me for some time because I had a dry spell. But now it is broken and I am back. It's a real joy to join you again and for the first time in months I feel alive again. Creating art is so much fun because it is so liberating. All you artists will know what I mean, and if you love art, but have never tried to produce some of it yourself, you have nothing to lose by daring to give it a try. Some of my more recent paintings are now on view at the Tree of Inspiration Gallery at 11 High Street in Moorpark. 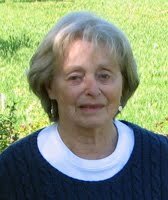 The gallery owner is Linda, who keeps her gallery open Tuesday through Saturday, from 11 a.m. to 5 p.m.
An immigrant from Vienna, Austria, who spent all of her working years in New York City, Elizabeth Miller fell in love with the beauty of our country. She spent her weekends and vacations capturing the sheer beauty of her surroundings along the East Coast on canvas and paper. An intensely visual person, Elizabeth worked by instinct and later took lessons with Joseph Hintersteiner, who himself had studied with the legendary Edgar Whitney. After an interesting and varied career, including chemical engineering and teaching high school math, Elizabeth finally found the freedom during retirement to paint full time. Now living in Thousand Oaks, CA, Elizabeth has often painted "en plein aire" to get a better feeling of the special light and colors of this fabulous corner of the world. and painted her personal interpretations of Southern California. 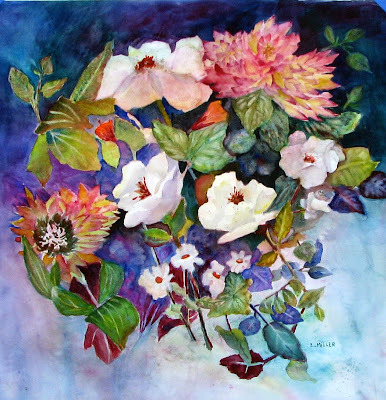 Elizabeth is an active participant in local art associations, including the Westlake Village Art Guild, California Gold Coast Watercolor Society, and Buena Ventura Art Association. She has earned numerous awards. Her work can be found in private collections throughout California and other states.